A new crypto-backed league will be coming to revolutionize the dead of the American football season. The new entity will be backed by crypto investors who want to bring the football action back in the period between February and July, when the NFL is not running. The National Football League (NFL) is quite the event in the United States. It also has an air of exclusivity around it, with competitions taking place between August and January, which is a rather short period. This doesn’t seem to have put a dent in the finances of the participating teams nor the main organization, though, with their revenue soaring higher year in and year out. A new league is needed to satisfy fans’ appetites for high-end competitive action in the months leading up to the NFL, however, and the hopes and expectations of football aficionados are finally coming true. The Fan-Controlled Fan League (FCFL) is preparing to provide fans with more football action to watch and bettors with even more numerous opportunities to place a wager. With two NFL professionals already signing up, the FCFL promises to be rather exciting, too. 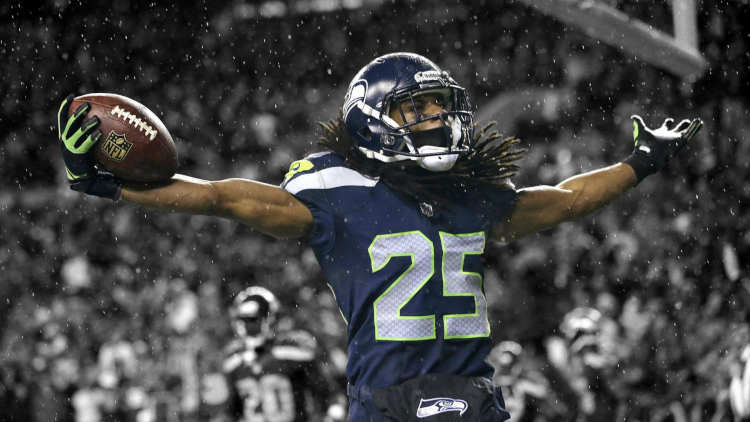 Richard Sherman at a NFL game, rejoicing after scoring a point. Source: Flickr. The FCFL has already signed Marshawn Lynch and Richard Sherman, with the NFL stars becoming captains and owners of new FCFL teams. Lynch presently plays for Oakland Raiders and Sherman is with the San Francisco 49ers. In a word, the expertise of the NFL is going to spill over to players who are equally passionate about the game, but not quite committed to make the serious NFL cut. Lynch and Sherman are by no stretch rivals, with the pair having worked together at Seattle Seahawks and having a lot of respect for each other. It’s in this context the funding of the league needs to be settled. The FCFL will manage its funding slightly differently than what we are used to. For starters, it will use cryptocurrency. The organization has already added blockchain expert New Alchemy to assist it with the launch of its own digital token system. As a result, fans will be allowed to use a dedicated platform to purchase, sell and even trade the digital currencies, which will aptly bear the name of Fan Access Network (FAN) token. A more specific focus is on how the platform is fan-centered. Players will de facto be in full control of how the league operates. They will be able to schedule matches, appoint team members, hire coaches, and even launch teams with their specific unique names. Naturally, this will be a collective effort, which means that individual players will not be able to do as they please willy-nilly, but rather take their suggestions up for a vote. Eight teams will participate at first, with the teams playing in special studios with cameras imbedded in the helmets of each player, so that fans can witness the evets as they unfold. While the playfield will be cut in half, down to 50 yards, the idea behind the FCFL promises to be just as exciting.